Introduction: Got the wintertime bass blues? Finding those quality bites harder and harder to come by? 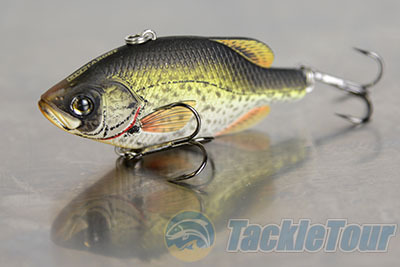 Maybe it is time to put away some of those wide wobble crankbaits and reach for a good old fashioned lipless crank. Only in the case of the Live Target Crappie calling this bait "old fashioned" might not be accurate as the company puts a new spin on an old formula. Let's take a closer look at the Live Target Crappie Series to see if this bait has what it takes to get you to put down some of your favorite traps to try something new. Impressions: There are a lot of good lipless crankbaits out there and my go to baits have typically included the Lucky Craft LV500, Strike King Red Eye Shad, and of course the good old fashioned Rat-L-Trap. These four baits have accounted for over 80% of the fish I have ever caught on a lipless crank, and like so many other baits once I became confident with them there was little reason for me to experiment with new baits that resided outside my arsenal. But what if adding a new bait could increase both your strike and catch rate? 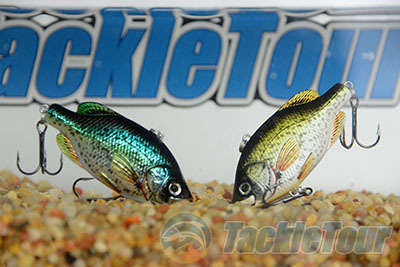 Which is exactly what Live Target sought out to do by creating a series that introduced a more realistic looking Crappie design than anything else on the market. 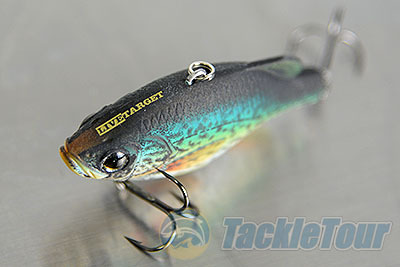 While there are other lipless crankbaits out there that exhibit quality finishes there isn't any bait on the market that can quite match the realism that Live Target brings to the table when it comes to imitating a juvenile crappie. Quality/Construction: These baits not only have a very distinct profile, complete with a thin tail and protruding fin design, but the high quality detailed paint finishes that Live Target has become known for. 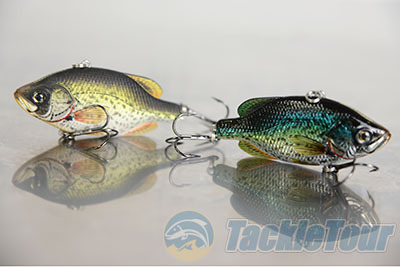 These are some of the most realistic looking lipless baits you can find and feature scale patterns, 3D texturing, and detailed paint finishes that really bring the lure's to life. 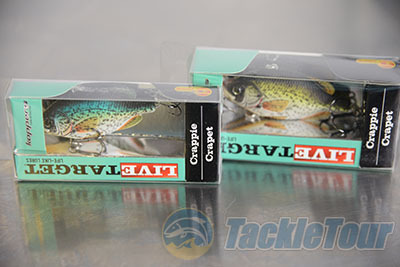 Overall construction and hardware on this bait are above average and unlike many other lipless crankbaits these bait's come with high quality Daiichi hooks that are good enough to fish with right out of the box. If you targeting any fish bigger than largemouth, like Stripers for example, than you will still want to upgrade to a thicker wire hook. While all of the Live Target bait's feature the same basic layout there are five different patterns to choose from which include Metallic Gloss, Natural Matte, White Crappie, Yellow Matte, and Yellow Metallic. There are two sizes to select from with the 65SK (2 1/2") and the 70SK (2 3/4"), and though they are almost the same length the 70SK has a much wider profile. 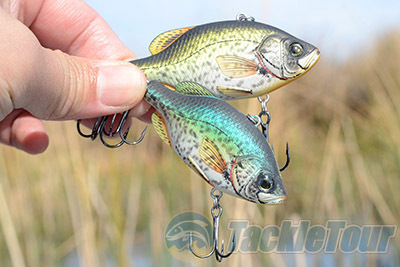 Matching the hatch is important when fishing lipless cranks and there are enough sizes and patterns in the Live Target Crappie for anglers to be dangerous, though a larger, and heavier, lure would be a welcome addition for fishing those really cold days when you need to get in front of deeper holding fish. Performance: We have been fishing this bait for over 18 months on a variety of different bodies of water from California to Wisconsin. While we did fish these baits in warmer conditions we logged many more hours on the water with the Crappie in the cooler months when we typically turn to lipless baits. As with other crankbaits the deeper you want to fish the more likely you will want to tie on the larger bait. This also provides an opportunity to use heavier lines with less stretch, though I personally love fishing lipless baits with braid to better transmit vibration, contact and strikes. I found the Crappie to be a pretty tight wiggler, which is what you want in a lipless crank, especially in cooler water when fish prefer something more subtle than a wide wobbling billed hardbait.